The men and women defending our nation have done it again! For the second year, Joint Base San Antonio (Fort Sam Houston, Lackland AFB and Randolph AFB) has increased its energy savings by participating in CPS Energy’s Demand Response program. The Demand Response program is a voluntary load curtailment program for our commercial and industrial customers. The program is designed to reduce our peak load growth by incentivizing customers to shed electric load on peak summer days. Simply put, when lots of people are using lots of energy, JBSA and other Demand Response participants find ways to save so that energy can be used by others, or to create enough reserve to protect our statewide grid. 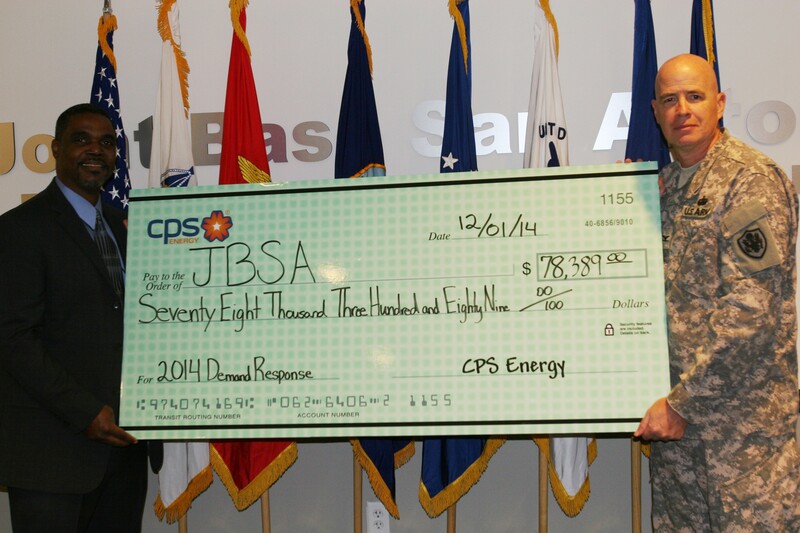 In 2014, JBSA increased its contracted kW amount to 995 kW up from 611 kW in 2013. “Ultimately, JBSA saved far above the contract, nearly doubling its performance from the prior year. The installation’s effort greatly contributed to our energy goals during the most critical time of the year for our power plant fleet. We applaud their leadership’s commitment to continue this trend by pledging to double their 2014 kW participation in 2015,” said Garrick Williams, CPS Energy’s director of JBSA Energy Solutions. Earlier this year the 502nd Air Base Wing launched an energy campaign designating 2014 as an Energy Action Year throughout Joint Base San Antonio. As part of their commitment, the installation reduced its energy consumption by 1,170 kW and received a rebate check in the amount of $78,389. CPS Energy’s Garrick Williams director, JBSA Energy Solutions presents Col. Mark Lee with a CPS Energy Demand Response rebate check. From June 1 – September 30, 2014, JBSA reduced load across 15 sites on 10 different occasions during peak demand times. They reduced consumption by basically raising thermostat settings, turning off hot water pumps, and reducing unnecessary lighting. Sounds like a good lead to follow. ← Help a neighbor in need, make a SnowPeep!